The Travelin Maine(rs) love to travel inside and outside of Maine. They’ll be telling you about their out-of-state journeys in occasional future columns. 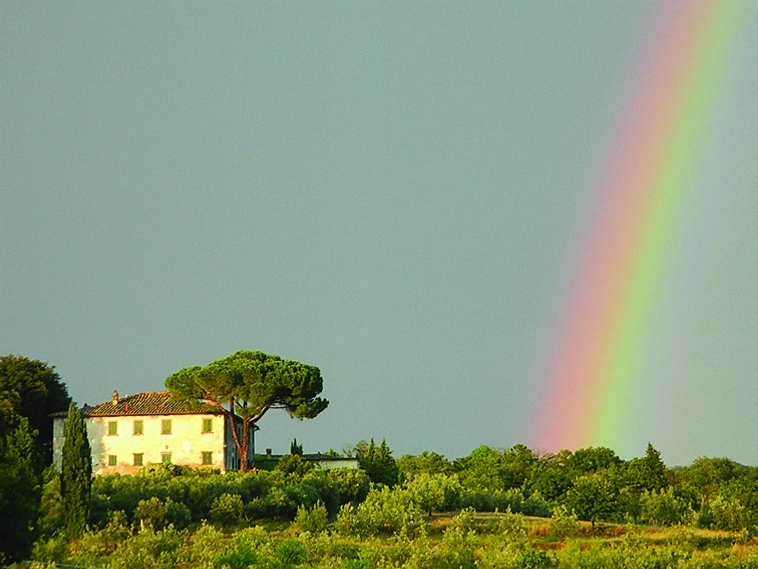 This week’s focus is on Italy’s Tuscany region. 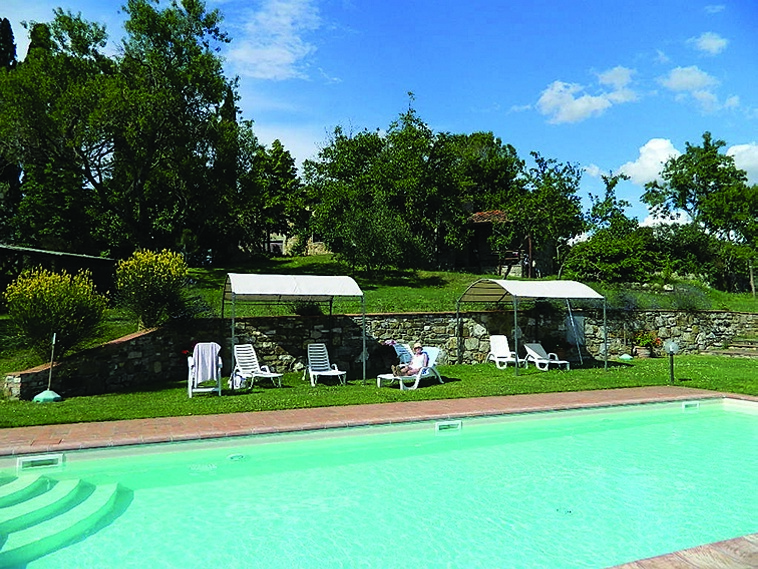 The pace of life in Italy’s Tuscany region brings us back often. This is not “slow travel.” This is slow living. 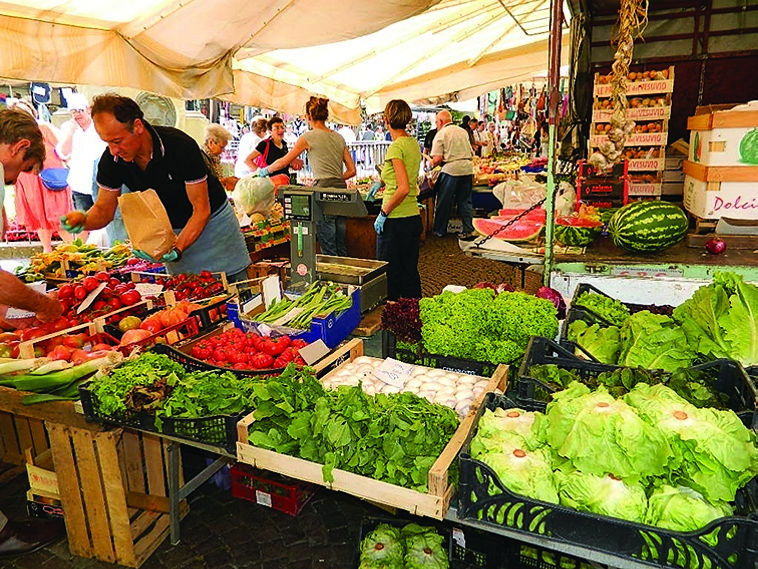 Italians shop daily for food, focusing on fresh produce, pasta, meat and cheese. The country shuts down for 3 hours every afternoon for a leisurely lunch, nap and relaxation. The evening meal doesn’t begin until 7:30 p.m. or later and lasts for hours. Italians are friendly. In the villages, everyone walks and greets you with a smile and an enthusiastic “Buongiorno!” in the morning or “Buona Sera” in the evening. Many people speak at least a bit of English, but we try to use as much of our limited Italian as possible. 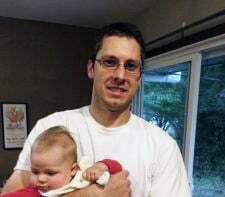 My Maine accent and mispronunciations usually bring a smile. They seem to appreciate any effort to speak their language. Long, lingering meals feature an appetizer, a primi of pasta, secondi of meat, dessert and, of course, wonderful (and very inexpensive) wine. They often finish their meals with a salad. Restaurants do not turn over tables. Your table is yours for the evening and your meal is served at your own pace. Your server will not bring your bill until you ask for it — indeed, demand it. Italians don’t just eat. They celebrate their food. And oh, what food this is — creative and fresh featuring tasty sauces. We join in their celebration with enthusiasm! 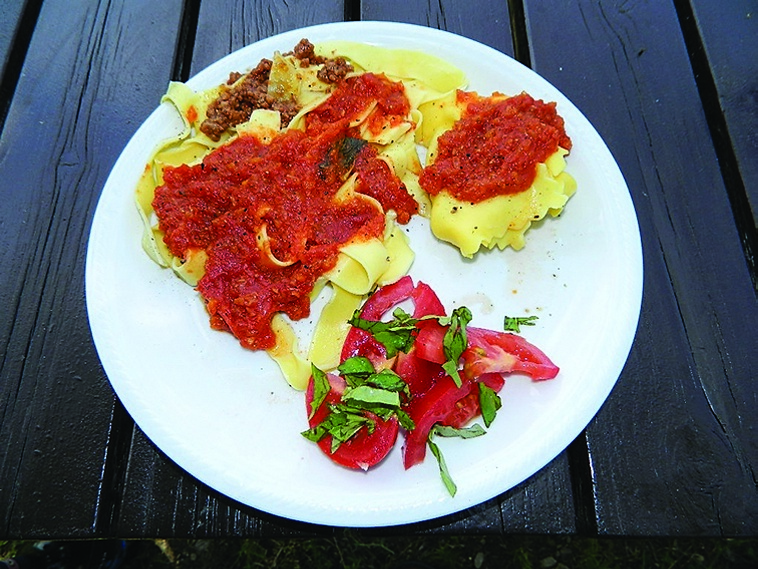 Tagliatelle with ragu sauce; Pappardelle with wild boar sauce; Risotto with pecorino and sausage; Ravioli stuffed with spinach and covered in a sauce of gorgonzola and walnuts. Yum! Each day we choose one restaurant for our main meal, either lunch or dinner. 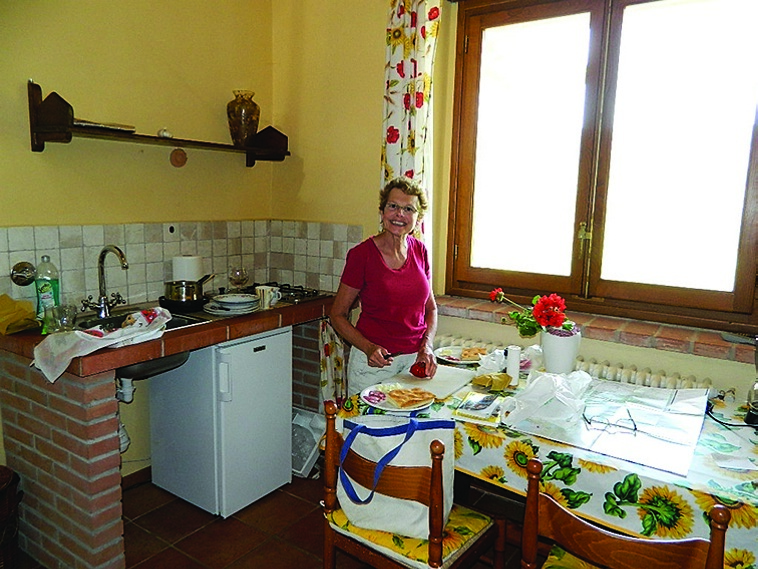 Breakfast is always at our kitchen table — or our outside table — and consists of fresh fruit, the world’s tastiest yogurt, bread, cheese, coffee and juice — plus a million-dollar view of the surrounding hills and valleys full of olive groves and grape vines, ancient homes and churches. We love “our apartment” Girosol (“facing the sun”) at Il Santo, a small family winery on a hill above our favorite village of Greve, 45 minutes south of Florence. It’s a market town full of small shops and restaurants. Our hillside location is quiet with stunning views, and just a 10-minute walk from the village square. The square is anchored by a church where we enjoyed a beautiful Easter Sunday service on our very first visit here. Il Santo offers just three apartments. 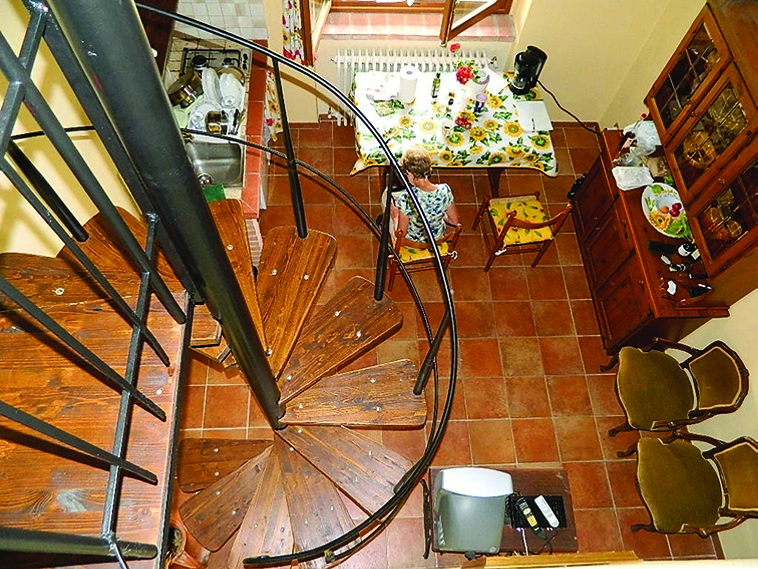 Ours had a large downstairs kitchen, a large upstairs bedroom and a full bath. The view from our kitchen table was stunning. The apartment rents for less than a Portland hotel. Each morning we pull out our map and choose a walk on one of the ancient gravel roads that wind up, down and over the hillsides that surround us, taking us past old homes, vineyards, olive groves and through forests full of birds. I’m certain the locals make fun of the tourists from Maine with binoculars always stuck to their faces. We do a lot of birding here. 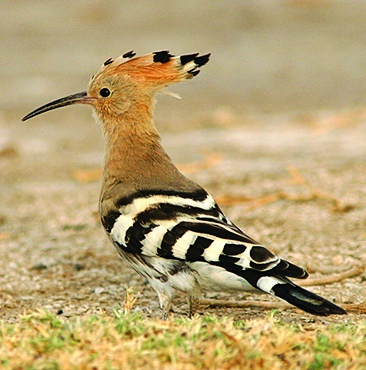 No one should die before seeing a Hoopoe — what a stunning bird! My first look at a Hoopoe came when Lin shook me awake at 7 a.m. on our first day, almost shouting, “You’ve got to see this bird!” And I had to admit, it was magnificent. So I couldn’t be grouchy about getting woken — even though I later learned that the Hoopoe is the “bird of ill omen.” We suffered no bad luck. And the next morning, there were five Hoopoes on the lawn! Our travels in Italy are quite likely different than most tourists’ visits there. 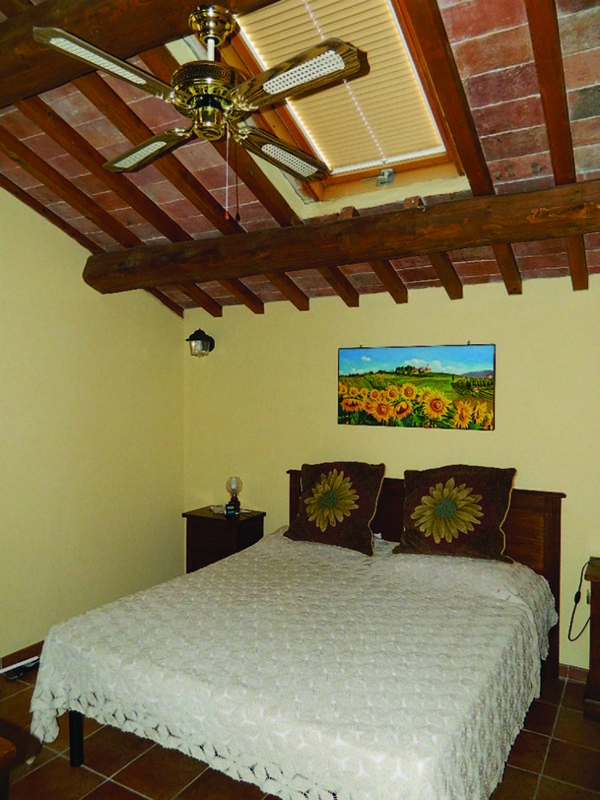 We have visited some cities, including Florence, and enjoyed wonderful museums, restaurants and inns. 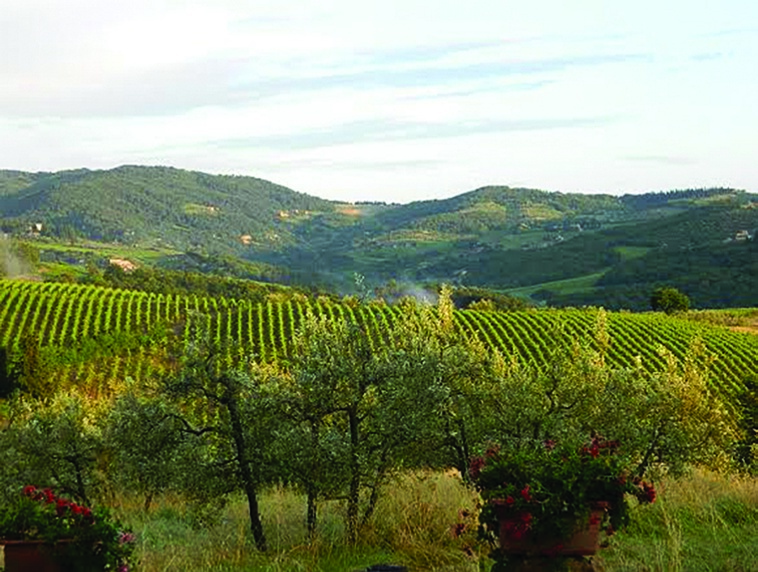 But we are country folk, and that’s why we now spend all of our time in Tuscany, a rural area with ancient hilltop towns, olive groves and vineyards that snake up and over the hills. We appreciate the pace of life Italians have perfected. In rural Tuscany, they live quite simply, shop locally, grow their own food when they can and make every effort to buy the freshest food they can find. This may be at a farmers market in a nearby village or at one of the many food specialty shops wherever they live. When I go to Italy I certainly want to sample the delicious Italian dishes at restaurants, but I don’t want to eat out for every meal. 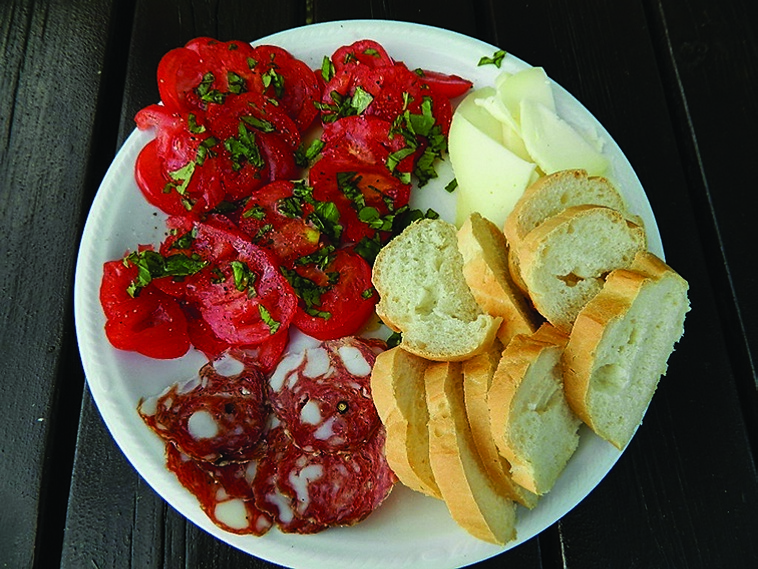 I love cooking something easy by picking up fresh produce, incredible local Pecorino cheese, salami and bread just as the local folks do every day. I feel at home in Greve, a village we’ve visited four times now. I know where the shops are and can peruse the fresh fruits and vegetables to decide what looks most tempting. Sciatiatta bread is a must for sandwiches — it’s a thin flat bread that is salted on top. My Italian is pitiful and the baker’s English is equally limited, but somehow I manage to buy the sciatiatta we need and a baguette. I love stopping by the fresh pasta shop for tagliatelle or ravioli, and perhaps some house-made sauce ragu. How can you go wrong with freshly made pasta? An elegant meal can be produced without a lot of fuss, to be eaten on our outside table at the apartment we’ve rented. 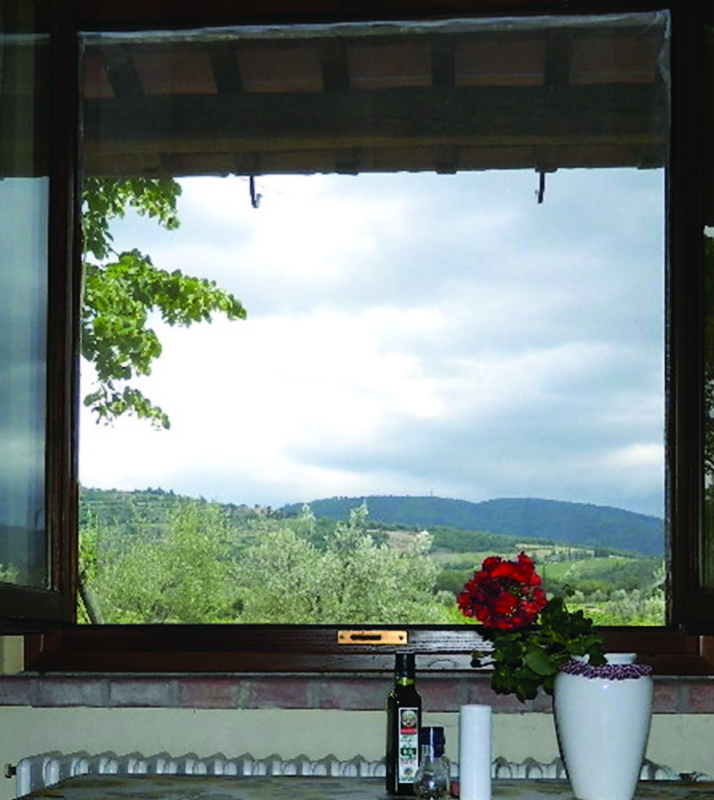 Local wine — produced two houses up — and a stunning view of the hills covered in vineyards and olive groves make anything we eat memorable. I indulge in lots of fresh tomatoes when I’m here. Walking into my favorite produce shop, I note that the tomatoes are dead ripe, none of those pretend pink ones we have in our supermarkets. I found an heirloom variety that made the best caprese sandwich imaginable. Fresh fennel is abundant, as is eggplant. It is hard for me to not grab everything I see because it is so perfect. This trip, I decided Italy has the best fruit I’ve ever tasted. The strawberries were unlike any I’ve ever had. We tried apricots and found them addicting. Unexpected things happen here and the people are incredibly friendly. George and I were taking a walk one morning along the village streets when we passed by some men cutting branches from a tree in a front yard. Looking down, I saw fresh cherries in the road! Unable to stop myself, I grabbed a couple and had a taste. Holy cow, these were amazing. I doubled back to see if I could buy some from the man sitting on a bench picking cherries from a branch. His smile spread across his face and he replied, “No, no, they’re free!” He hands me a branch and says to also help myself to those in his basket. I’m going to remember those cherries for a long, long time!